ASSAMSTADT, GERMANY--(Marketwired - Apr 22, 2014) - World first: ecom PDA i.roc® Ci70‐WWAN offers new ways to stay connected in remote hazardous areas to improve safety, workforce productivity, realtime visibility and itemlevel tracking. The recent introduction of WWAN (Wireless Wide Area Network) capability for ecom's i.roc® Ci70 - Ex handheld computer (PDA) allows operators, inspectors and logistics controllers working in remote Zone 1 / Class I, Div. 1 hazardous areas to stay connected to corporate teams using existing mobile phone networks. Pipelines, onshore Oil & Gas wellheads, large chemical plants & refineries, open‐cast mines, remote explosives stores, and large yards holding hazardous material have traditionally been a headache for businesses looking to introduce more efficient and accurate ways of working using mobile computers -- often due to the risk, cost and effort required to implement a wireless WiFi network. Inspection and logistics contractors also face the challenge that their backend systems are often not connected to their customer's network and, when a wireless WiFi network does exist, the contractor PDA can be denied access to this network for security reasons. As a result, paper‐based recording has remained, or has been replaced by PDAs operating offline from the network -- both of which have the disadvantage that the latest information held on corporate systems cannot be viewed on demand to assist with solving the problem discovered by the user on arrival at the site. But not anymore -- the cure for this headache is here. Advanced WWAN technology is now available on ecom's i.roc® Ci70 PDA, enabling the use of commonly available mobile phone networks to provide realtime connectivity to centralised and cloud based networks. This improves access to the latest information while the user is standing in front of the valve to be inspected or at the hazardous material to be shipped. Realtime feedback is also provided from the site back to the corporate systems, enabling realtime visibility of the latest information by expert teams located elsewhere, bringing better collaboration opportunities and faster decisions to solve the problems discovered. 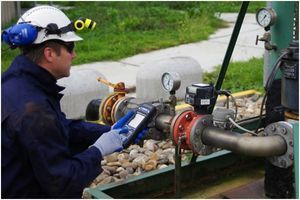 Similarly, the WWAN capability enables the location and safety of lone workers to be monitored by the inspection contractor more easily across multiple hazardous sites and multiple clients without the need for another device. When combined with the integrated GPS capability of the i.roc® Ci70 -Ex, inspection and repair locations of a pipeline can be "geo‐tagged" to reduce the time to locate the area next time. And, any abnormalities can be reported automatically to the pipeline management team, giving the opportunity to solve the problem when the technician is there. Accurately identifying, locating and tracking containers, equipment and material also becomes easier -- the combined capabilities of WWAN, GPS and RFID (and barcode) now offered by the i.roc® Ci70 - Ex provides a powerful set of tools to track items (and their contents, in the case of containers) as they move around the world and on/off sites, reducing the time wasted searching for lost items and improving customer service. The Ci70‐WWAN has been certified for use in potentially explosive Zone 1 / Class I, Div.1 environments (including explosive dust environments) in Europe and North America, and other countries recognising ATEX, IECex and NEC certification and is as well AT&T certified. To find out more, please visit www.iroc‐ci70.com. Globally, ecom instruments is the leading provider of mobile devices for use in explosive areas, whether including chemicals and petrochemicals, pharmaceuticals, oil and gas production, mining or energy and the environment. For over 25 years, ecom has set the standards and gathered comprehensive expertise in explosion protection for daily use in hazardous industrial areas across the globe. In its four core disciplines of communication, mobile computing, portable hand lamps and measurement calibration, ecom instruments offers a huge variety of innovative and proven solutions.